Do You Wish for Deeper Friendships? Friendships between women get a lot of hype -- from inspirational stories of people donating a kidney to a friend to the pink sparkly folklore of girls nights out and girlfriend vacations. So it's easy to think most women have an amazing tribe rich with laughter, secrets, chick flicks, and pots of proverbial soup. But the truth is that between two-thirds and three-fourths of Americans believe there is more loneliness in today's society than there used to be, report dissatisfaction in their current friendships, and feel they have fewer meaningful relationships than they did five years ago. Another statistic comes from a study, published in American Sociological Review that looked at two decades of social isolation in the United States. To the question of how many confidantes one has, in 1994 the common answer was two to three confidantes; as of 2004 the answer was closer to zero. I think it's safe to say that the way we're currently doing friendship isn't working for the vast majority of us. In fact, I conducted a Frientimacy Survey last spring in which twelve hundred women rated their current satisfaction levels with the depth of their friendships (what I call frientimacy). frientimacy, what number would you give your current experience? I'm thrilled that 20 percent reported an 8 or higher. But note that most women are twice as likely to score a 1 or 2 than a 9 or10; and that over 50 percent are at 5 or below! These results reflect other studies that claim 75% of Americans are dissatisfied with their current friendships. 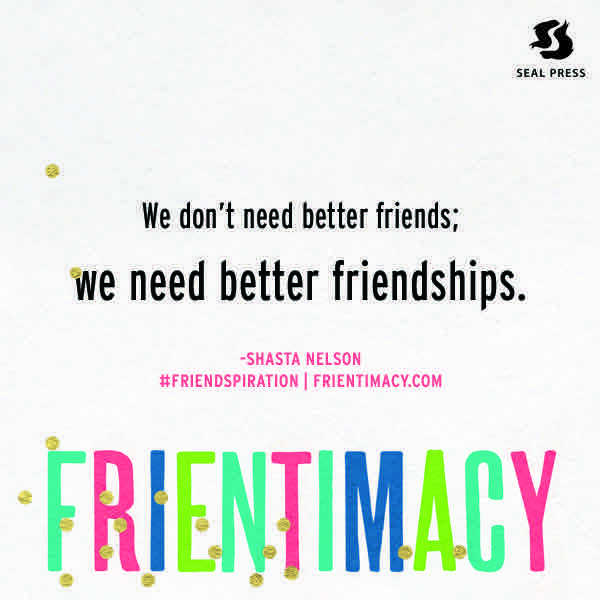 The truth is that for most of us there is a gap between the frientimacy we have and the frientimacy we want. When I'm in front of an audience, I often ask, "How many of you are lonely?" As you might imagine, the inclusion of the dreaded L word means very few hands go up, though I do see a few heads nod. But when I ask, "Do you wish you had more deep and meaningful friendships?" nearly every hand rises. Though we may know a lot of people, that doesn't mean we feel we have meaningful connections. But if we don't acknowledge our need--and admit that we lack meaningful connections, that we feel disconnected--we limit our chances of getting our needs met. In other words, if we don't identify the problem, we can't do anything about it. To admit we wish for more meaningful friendships is the first step to inviting us to then ask the all important question, "What could I do to develop more fulfilling relationships in my life?"